Hey Everyone! I decided to do an outfit post today and had a photoshoot outside. Good thing my Father was here to take my pictures and the temperature was perfect!Thanks Dad! Anyways, here's my look, the key piece is this dress which I got from Soul Lifestyle 3 years ago in the Philippines. I brought it with me here in New York. :) I really love shopping and I used to go to SOUL every week when I was still in Davao. Right now, I wanna try buying online but I don't know if they ship internationally. 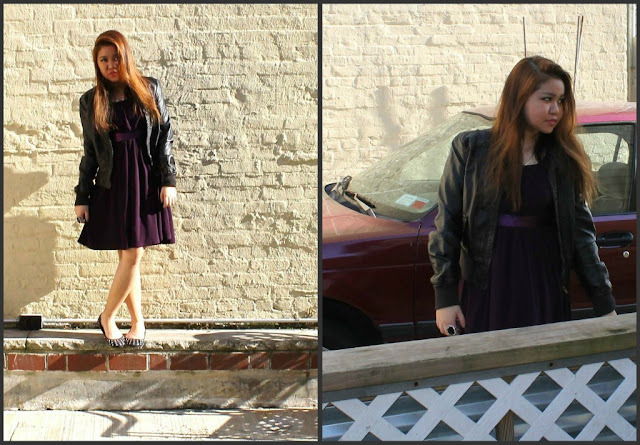 About my outfit, I wore a leather jacket, you can do that to make your look wearable from day to night. I didn't wear heels, I wore a pair of studded flats. Oh I love that dress!It's flowy isn't it?Nice flats too! It's nice that you still wear the dress.I like! I think they ship internationally but its kinda scary cause it might get lost while on transit. :p Anyway, great outfit! :) Love the shoes! That's a really nice dress! That dress is gorgeous! Love the leather jacket you added, its the perfect edgy accessory. :) You look fantastic!